The Commonwealth of Virginia mandates 12 continuing legal education (CLE) hours, including 2 hours in ethics/professionalism and 4 hours from live programs. Failure to meet deadlines results in $100 fines. The Virginia Bar Association offers a wide variety of continuing legal educational programs to satisfy your MCLE credits. In 2014, so far, we've offered programming at our Annual Meeting, Spring Symposium, Bankruptcy Law Conference, Health Law Legislative Update and Summer Meeting. See below for a list of our upcoming programs or check out our CLE calendar. Unable to attend in person? No problem. The VBA offers all lawyers continuing legal education courses on demand through VBA Online CLE, written materials included. VBA members enjoy special discounts. This conference is a presentation of The Virginia Bar Association Health Law Section in cooperation with the Health Law Section of the Virginia State Bar. Registration takes place at 11:45 a.m., with programming beginning at 12:05 p.m. Attendees are welcome to bring lunch to the program. A reception will follow at VBA on Main. The conference is open to all attorneys. The VBA welcomes new members. Signing up is easy online. If you're already a VBA member, but not a member of the VBA Health Law Section, consider joining. Annual dues are $25. VBA and non-VBA members can register online above, or download the PDF below and send it to the VBA office via mail, fax or email. The festivities for the Young Lawyers Spring Meeting will begin Friday night, with dinner in downtown Richmond at Kobe Japanese Steaks & Sushi, open to all young lawyers, law students and guests/spouses/children. Formal programming will begin Saturday morning with a YLD members-only breakfast and business meeting, followed by CLE programming, an afternoon in Scott's Addition (Tang & Biscuit and Courthouse Creek Cider) and dinner at Pies & Pints, open to all young lawyers, law students and guests/spouses/children. Registration for the Young Lawyers Spring Meeting is open. All young lawyers and law students are invited, including VBA members who have yet to get involved. The registration fee is all inclusive and covers Friday dinner, Saturday breakfast and business meeting (YLD members only), lunch, an afternoon in Scott's Addition and dinner. Electronic messaging has changed the efficiency on how you handle client communication, however, there are specifics you should know about how these communications can affect your ethical obligations. Join Todd Sexton, a cybersecurity and data-handling expert, who will help you better understand the changing data handling regulations, cybersecurity threats and how they may affect the ethics around your client communications. "Are Your Client Communications Colliding with Your Ethical Obligations?" will investigate changing data handling regulations, trends from the legal community, and client needs and expectations. Participants will come to understand the way cyber-crime could affect their practice and the most effective ways to protect themselves and their clients. This 60-minute presentation is available to VBA members at no charge. Registration is required. This year’s program will expand to 6.0 (1.0 Ethics) approved MCLE credits with five panels of experienced practitioners and bankruptcy judges. Topics include litigation opinions, expert witnesses, preparing, filing and prosecuting cases, appeals, and ethical issues in courtroom practice. The event kicks off on Thursday evening with a cocktail reception to welcome meeting attendees and guests. A golf outing is being planned at Kingsmill on Thursday afternoon. Please contact Patrick Keith for more information. On Friday, after a breakfast buffet, programming will take place until 12:15 p.m. A luncheon will follow, then programming will continue until 3:15 p.m. Guests can call the Kingsmill Resort reservations team at 757-253-1703 or 1-800-832-5665 to book their rooms. Please reference “The Virginia Bar Association – Bankruptcy Conference” for our group rate. The Virginia Bar Association Law Practice Management Division, the Virginia State Bar Section on the Education of Lawyers, Virginia CLE and the American University Washington College of Law Legal Rhetoric Program are co-sponsoring this daylong workshop. Are the legal writing classes you took back in law school the last writing training you experienced? Would you like an opportunity to study and improve your basic legal writing skills? This workshop is an intensive legal writing course, facilitated by judges, legal rhetoric professors and experienced attorneys. While not an advanced writing course, this workshop will serve as a basic refresher and is designed to make you a better and more confident legal writer. The workshop will provide classroom instruction as well as hands-on writing and editing experience for all participants. Plus, attendees will have the option to attend a breakout session focused on either litigation or transactional practice. Space is limited to 50 attendees. Register on the Virginia CLE website here or call 804-979-VCLE (8253). Note that this program is discountable. This interactive opening session will cover basic grammar and writing strategies and act as the foundation for the entire workshop. Topics discussed will include the following: the language of the law; noun-pronoun agreement; avoiding misplaced modifiers; avoiding ambiguity; proper use of commas, colons, and semicolons; and sentence and paragraph construction. This session will discuss the importance and necessity of thinking through a document before beginning to write it. It will cover planning strategies that allow legal writers to write any type of legal document and will help them as they convert one type of legal document to another, e.g., turning an internal office memo into a client letter and/or a trial court brief. This session will also cover specialized documents like e-mails. This lunch session will address the ethics implications of legal writing content and style. It will first focus on lawyers' possible duty to disclose bad facts and bad law, and then cover the ethics rules prohibiting false statements to the court and others. The session will then turn to legal writing style, including the difference between ethics and professionalism and the rules governing lawyers' criticism of judges. 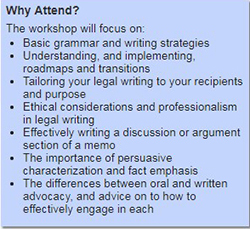 This session will teach attendees how to effectively write a discussion or argument section of a memo using an organizational strategy called CREAC (Conclusion/Context, Rules of law, rule Explanation, rule Application, and Conclusion), which is a variation on the IRAC (Issue, Rule, Application, Conclusion) formula most lawyers learned in law school. This humorous and helpful session will reinforce organizational writing strategies, such as roadmaps and transitions. Concepts covered include the following: context paragraphs, headings and subheadings, roadmaps, umbrella sections, conclusion sections, and thesis sentences. In these sessions, held in different rooms and led by judges, practicing attorneys, and/or professors, attendees will receive practice tips and pointers from the group leaders and have the opportunity to ask specific questions concerning legal writing topics relevant to litigation or transactional practice, respectively. Program faculty will discuss the differences between oral and written advocacy and offer advice on how to effectively engage in each. This highly interactive group exercise will teach attendees the importance of persuasive characterization and fact emphasis. Participants will be given a fact pattern, which they will need to read, and then will be broken into groups representing either Jack or the Giant. Groups will need to select facts that can be persuasively characterized and emphasized. A full group discussion of how each side could have characterized and used the same facts persuasively will conclude the exercise. Heather E. Ridenour, American University Washington College of Law / Washington, D.C.
*David Spratt, American University Washington College of Law / Washington, D.C.
Rates start at $229/night. Reserve a room online or by calling 1-877-509-8400 and referencing The Virginia Bar Association. Registration for this event is not yet open. Bookmark vba.org/19labor, and check back in the coming months for information on registration. In the meantime, you can express your interest in receiving email updates as details become available. Another way you can express your interest is to join the VBA. Signing up online is easy. And for VBA members who want to add a section to their membership, doing so is easy too. Join the VBA Law Practice Management Division for a roundtable discussion on mentorship, particularly as it relates to supporting (i) diversity and inclusion and (ii) attorney wellness efforts at firms and companies with law departments. Bookmark this page for more information as details become available. In the meantime, you can express your interest in receiving email updates as details become available. Registration for this event is not yet open. Bookmark vba.org/19ccff, and check back in the coming months for information on registration. In the meantime, you can express your interest in receiving email updates as details become available. Registration for this event is not yet open. Bookmark vba.org/19yldfall, and check back in the coming months for information on registration. In the meantime, you can express your interest in receiving email updates as details become available. The Health Law Section of the VBA presents the 15th Annual Virginia Health Care Practitioners' Roundtable, taking place Oct. 24, 2019, in Richmond, Virginia. Registration for this event is not yet open. Bookmark vba.org/19health, and check back in the coming months for information on registration. In the meantime, you can express your interest in receiving email updates as details become available. The roundtable is one of the best opportunities of the year to connect with colleagues from across Virginia to discuss taxation issues. A hallmark of the roundtable is its discussions, instead of merely lectures. Please bring pending cases, problems, strategies, tactics, and issues from your own practice to share. The VBA Taxation Section looks forward to you joining them for great conversation and sharing. Registration for the 30th Annual Tax Practitioners' Roundtable is not yet open. Bookmark this page for more information as details become available. In the meantime, you can express your interest in receiving email updates as details become available. Registration for this event is not yet open. Bookmark vba.org/19admin, and check back in the coming months for information on registration. In the meantime, you can express your interest in receiving email updates as details become available. If you are interested in information about sponsoring, exhibiting or advertising in conjunction with the 130th Summer Meeting, please contact the VBA at thevba@vba.org or by calling 804-644-0041. If Virginia attorneys are part or all of your target market, this is a great way to connect with legal professionals across Virginia. If you are interested in information about sponsoring, exhibiting or advertising in conjunction with the 131st Summer Meeting, please contact the VBA at thevba@vba.org or by calling 804-644-0041. If Virginia attorneys are part or all of your target market, this is a great way to connect with legal professionals across Virginia.